On the 2nd day of our Spring weekend travel, we checked out early (Nikko Park Lodge) and went straight towards the Kanmangafuchi Abyss in order to drop by at the famed Nikko jizou site. 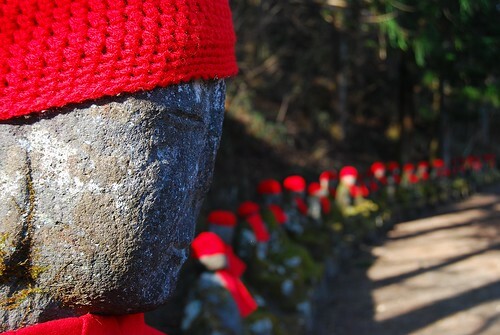 Jizou (Jizō) is known for being a guardian of unborne babies, thus, statues representing his divinity are often portrayed as wearing children's clothing such as bibs. Narabi-jizou literally means Jizous in line. Another name for this site is Bake-jizou where 'bake' means ghost. They say that the count of jizous placed on this site had never been consistent, implying that the jizou statues appear and disappear at times.